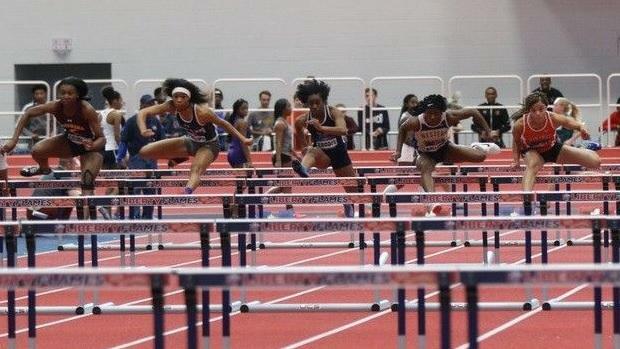 At the 2012-13 indoor state championships, Howard's Christine London captured the 3A girls 55 meter hurdles title with a personal best time of 7.98 seconds. Since then, a sub-8 performance has eluded even the best of Maryland hurdlers - but no longer. Bishop McNamara senior Taylor Grimes ran 7.99 seconds in the preliminary round of the event on Friday at the Virginia Showcase. Bullis teammates Leah Phillips (who had held the MD #1 spot entering today) and Masai Russell finished third and fourth with identical 8.02 performances. The Bullis girls generated the most buzz on Friday night in the invitational 4x400, however. They became just the second girls high school team in U.S. history to break the 3:40 barrier in the event, taking down Hydel Group of Schools (Jamaica). You can catch their post-race interview with MileSplit here. The Franklin girls finished in third with a US #2 performance of 3:44.55. Bullis' Ashley Seymour defended her 200 meter dash title at the Virginia Showcase with a MD #1 (and US #7) 24.36 effort. Franklin's Tylar Colbert finished third at 24.76. Seymour was also the top Maryland finisher in the 55 meter dash, running a MD #2 time of 7.05 to finish fourth and qualify for the finals on Saturday (along with teammate Leah Phillips and Riverdale Baptists' Jordan Braxton). Over in the pit, Bullis senior Cierra Pyles overtook Taylor Grimes for the state lead in the long jump with a season-best jump of 18'7.25 (good enough for second place in the invitational section). Grimes finished third. In the 300, Franklin's Cameron Hinton was the lone Maryland girl to crack 40 seconds (she finished sixth in the invitational section at 39.70). C. Milton Wright's Jessica Rogers was the top miler on the day, finishing seventh in the invitational section at 5:16.10.